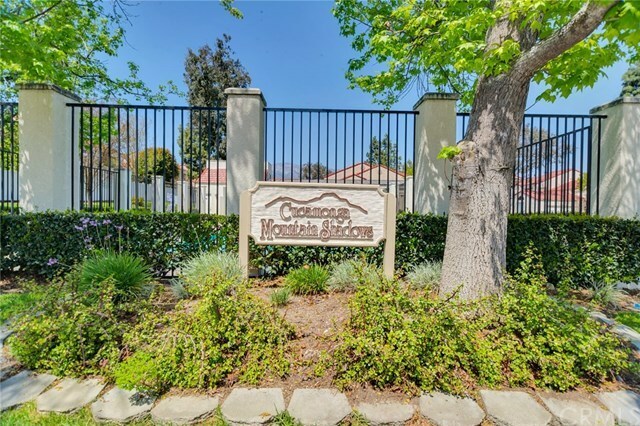 CUCAMONGA MOUNTAIN SHADOWS - OUTSTANDING OPPORTUNITY FOR QUALITY AND AFFORDABLE HOME OWNERSHIP IN RANCHO CUCAMONGA. CORNER UNIT TOWNHOUSE OFFERS 3 BEDS/2.5 BATHROOMS, FUNCTIONAL FLOOR PLAN, 2 CAR GARAGE AND QUAINT PRIVATE PATIO. STEP INSIDE TO FIND A BRIGHT AND AIRY LIVING ROOM WITH CATHEDRAL CEILINGS, TILED FLOORING AND DECORATIVE CURTAINS. THE DINING SPACE CONNECTS TO A LARGE KITCHEN WITH PLENTY OF COUNTER SPACE AND CABINETRY, WHICH CREATES A NICE FLOW DOWNSTAIRS. ENJOY MORNING COFFEE OR SUMMER BBQs ON THE ADJACENT PATIO. UPSTAIRS, YOU'LL FIND A SPACIOUS MASTER BEDROOM WITH VAULTED CEILING AND BEAUTIFULLY TILED WALK-IN SHOWER. TWO GUEST BEDROOMS ARE MORE THAN ADEQUATE & SHARE A FULL BATHROOM. THERE IS PLENTY OF STORAGE SPACE UPSTAIRS AS WELL. THE COMMUNITY FEATURES A SPARKLING POOL.